Find all practical information about Eurostar: deals, booking, timetables, prices, hints and tips for finding cheap Eurostar tickets. Eurostar is the best way to travel from the United Kingdom to France, Belgium, the Netherlands, Germany, Switzerland crossing the Eurotunnel. Thanks to Eurostar, you can visit the most beautiful European cities: Paris from £69 return, Brussels from £69 return, Amsterdam from 99£ return... Eurostar tickets are available for sale up to 6 months before your travel, but we recommend you book early to find cheap Eurostar train tickets. Prices are based on Standard Class return fares per passenger. Constructed by the Belgian Railways (SNCB), the French railway (SNCF) and the English railway (BR), Eurostar is the first European train, which revolutionized European train travel. Launched in 1994, this company is an international high-speed service between European cities, through the 31 miles long Channel Tunnel. At the beginning the company started running trains to and from London Waterloo International, Paris Gare du Nord, Brussels Midi and Lille Europe. On 1996, Eurostar launched services from a second railway station in the UK: Ashford International station. On 2006, Eurostar services were transferred from London Waterloo to the new St Pancras International station. In August 2009, the company reached the symbolic threshold of 100 million travellers. Eurostar trains can operate at speeds of 208 mph, allowing you to reach Paris in 2 hours from London, Brussels in 2 hours and Amsterdam in under 5 hours. Moreover, just with a change in Paris, Lille or Brussels, travellers can go to more than 100 European cities, like in the Netherlands (Amsterdam, Rotterdam, Schipol), Germany (Frankfurt, Munich, Cologne, Dusseldorf) and Switzerland (Basel, Zurich). 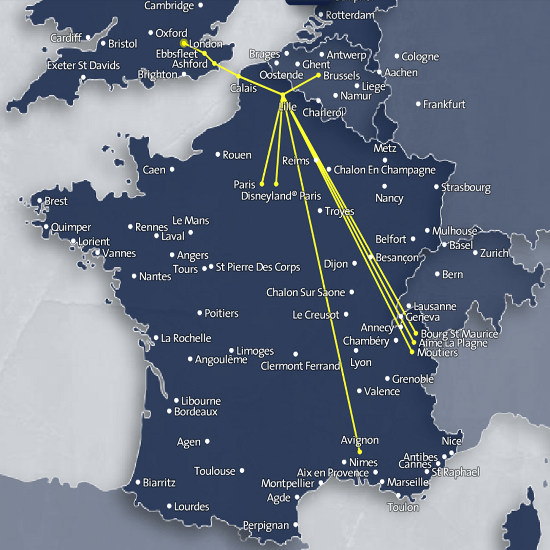 In 2014, Eurostar announced that it will create a new train line for May 2015 to connect London to Marseille via Lyon and Lille. Today, the popular train company carries thousands of people per day from the United Kingdom to France, Belgium, the Netherlands, Germany, Switzerland. Considered as one of the best companies in terms of customer service, it carries out daily connections to Paris, to Brussels, to Amsterdam and many other European cities. If you're looking for cheap Eurostar tickets, you've come to the right place. Here are the best prices selected for the coming days to travel with Eurostar. Your ticket to Paris, Brussels, Amsterdam, and other many cites is just few clicks away! Thanks to this train company, you can travel across Europe and discover the most popular European cities. For example, every day Eurostar connect London to Brussels and many cities in France, including Paris. Eurostar trains offer a great range of services. Discover all general information about the services available on board for your next travel. When you travel to Europe with Eurostar you are allowed to bring with you on board 2 bags no bigger than 85cm in length and 1 small piece of hand luggage. Children are only allowed to take 1 bag no bigger than 85cm, and 1 small piece of hand luggage. 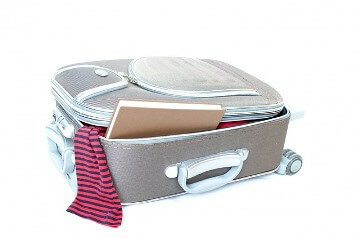 There is no weight limit, but if you travel with extra luggage, larger items or restricted items, you must go through the registered luggage service (only available on these following routes: London to Paris, London to Brussels, London to Lille). This service is not free you will have to pay £18 for luggage under 30kg or £30 for large items. 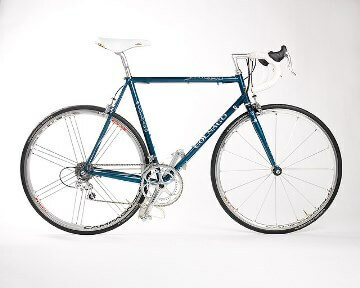 You are allowed to bring a bike with you on board but certain conditions must be respected. Indeed, you have three ways to take your bike on the Eurostar train between Paris, Brussels and London. Either, if your bike is up to 200 cm you can, when you book your own Eurostar tickets, reserve a place for your bike on the train in advance for £30 one way. Or, if your bike is under 85 cm you can place your bike in a suitable bike bag, and it will figure among your luggage for the travel. Otherwise if your bike bag is between 85 cm and 120 cm you can use the registered luggage service on the days of departure, put your bike in extra-luggage and pay a supplement for it from £10 to 30£. You can download the official Eurostar mobile app for iPhone or Android. You will book your ticket faster and it enables you to check in with just a scan of your phone thanks to the mobile ticket. You can also save your contact information and setting preferences, so you can save time for future bookings. Are pets accepted on board ? Eurostar has as strict policy on pets. Unfortunately, pets are not allowed on trains except for guide or assistance dogs. There are three classes available on board Eurostar trains, depending on which service you are travelling on: second class called "Standard class" and two types of first class: "Standard Premier" and "Business Premier". "Standard Class" is the cheapest offer. Second class on Eurostar trains combines simplicity and low prices. You enjoy the comfort of high-speed trains while benefitting from the low prices of second class to reach European countries. In Standard Class you can enjoy air-conditioned, free Wifi throughout St Pancras train station, and a selection of food and drinks at bar buffets. If you book your Eurostar train tickets in class "Standard Premier ", you will have first class seats that are more spacious and comfortable than in second class. In Standard Premier, you will get magazines offered on board and a light meal with drink will be served at your seat. First Class Business gives you access to premium services that offer many benefits. You can check in 10 minutes before the train departs. Before departure, you have access to exclusive lounges "Business Premier" where you will be offered drinks and refreshments. During your Eurostar train journey, you will enjoy spacious and comfortable first class seats, and newspapers and magazines will be made available to you. 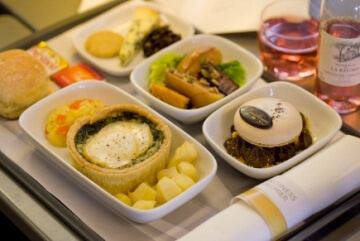 In addition, on board your Eurostar train you will be served a three course gourmet meal with drinks in your seat. Eurostar fares depend on the travel class you choose for your travel between Standard, Standard Premier or Business Premier. The price will be cheaper if you choose the Standard class compared to Business Premier price. Flexible ticket : this ticket type is fully exchangeable and refundable up to two months after the original date of departure. Semi-Flexible ticket: exchangeable before and up to 2 months after departure by paying a difference in price with the next available fare in the same class and a fixed fee of £30 per person per leg. This ticket is also refundable up to two months after the original date of departure with 15% deduction. Non-flexible ticket: this ticket type is cheaper than the flexible tickets, but is non-exchangeable and non-refundable. So you must to be sure to travel on the day selected. Eurostar prices are different according to your passenger category and depending on your age. There are 4 passenger categories: child (4-11 years old on day of travel), youth (less than 26 years old), Senior (at least 60 years old on day of travel) and adult (26-59 years old). Reductions are applied by the company according to the age of the traveller. Eurostar fares depend on the availability of tickets at the time when you make your booking. For your information, Eurostar tickets are available for sale up to 6 month before you travel. As a matter of fact Eurostar train fares work like air fares: the earlier you book the more likely you are to get a great price. Groups of 10 people or more are eligible for special pricing ensuring the best price-quality ratio. In fact, groups fares can be 10% cheaper than the individual rates, but once booked cannot be changed or refunded. The prices applied by Eurostar evolve over time. Here is a price barometer for the main train journeys indicating the minimum price observed and the maximum price for a single ticket. If you choose to book your Eurostar ticket online, you must follow the different steps described below. Select your departure station and your arrival station at the date of your choice. Select the train ticket you want according to the fare type and travel class. Enter your personal details and make online payment. Once the ticket purchased, you will receive a confirmation of your booking by email. You can print your ticket at home, collect it at the station or use a mobile ticket on your Eurostar app. On the day of departure you must check in 30 minutes (10 minute if you have a "Business Premier" ticket) before the train departs. To check in you'll need your ticket and your passport or identity card. Once the check in is done you can go to your seat and have a nice trip.